When you play the game of thrones, you win or you die. So if you're not that good a player, maybe go ahead and excuse yourself rather than trying to get all clever with things, huh? Stoic, duty-bound and honorable, Ned Stark embodied the values of the north. In moving to King's Landing to serve as Hand to his longtime friend Robert Baratheon, Ned fell on the wrong side of court intrigues and paid for it with his life. Sorry if that's a spoiler, but come on: you had to at least have a clue that's how things turned out. I mean, he's played by Sean Bean, and even ignoring the fact that he's the most famous name in the credits (and therefore probably also has the highest salary), he's still Sean-fricking-Bean, the guy who dies in every movie. If you see Sean Bean in something, you just assume he's going to die sooner or later - or, in at least one case, he's going to die sooner and later. That's right, Sean Bean is so good at dying in movies, he once found a way to die twice! The likeness on this figure is outstanding - there is no mistaking who it's meant to be, which was kind of up for debate: there are at least two runs of the figure, and the second wave looks a ton better. I realize it's been more than a dozen years, but compare this Ned Stark (one of the first toys Funko has ever made requiring a real likeness rather than a stylized approximation) to the Boromir made by ToyBiz (a company that had been making toys for at least a decade), and the difference is astounding. Remember how in that review we said you couldn't sculpt stubble? Guess what this figure has! My, how things change! The sculpt below the neck is no slouch, either. He's got normal boots, trousers, shirt, what have you, but what makes him look like a summer employee at Medieval Land Fun-Time World is the lightly armored gambeson, which is covered in rectangular plates arranged in a diamond pattern. It has buckles sculpted on the sides, and is held shut by a thick, studded belt with the end wrapped around itself. On his left breast is the brooch that signifies his role as The Hand of the King (it's basically the equivalent of being prime minister). In the books, each Hand is allowed to design his own symbol, but the show just has everybody using the same pin. The detail on the brooch isn't very crisp at all - it's basically just a gold blob on his shirt, like he dropped mustard on himself. 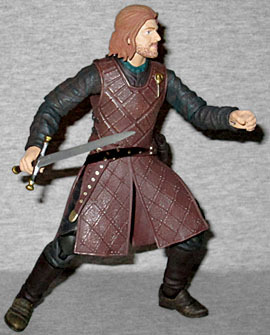 Ned's articulation is just like the other Game of Thrones figures: a balljointed head and neck, swivel/hinge shoulders, elbows, and wrists, a balljointed torso, balljointed hips, swivel thighs, double-hinged knees, and swivel/hinge ankles. Nothing on my figure broke, which is apparently a real rarity for Neds. The joints are made from clear plastic though, which explains everybody's problems. Sadly, his head does not pop off like Jon Snow's - that seems like a missed opportunity! 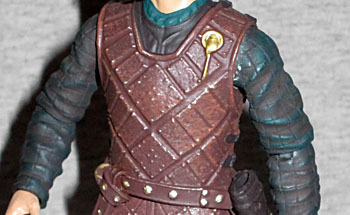 He comes with two swords: a normal longsword that fits in the scabbard hanging from his belt, and then the Starks' ancestral Valyrian steel greatsword Ice. Sadly, he does not come with Ice's wolf-pelt scabbard (nor with a fur-lined cape, which would make him look extra cool). Ice is more than 5" long, while his normal sword is a shrimpy 4" long. Due to a poor bit of design, it's nearly impossible to get the sword into or out of its sheath: the crossguard bumps into Ned's arm, so you have to bend the blade a bit to get it all the way in, and that is a recipe for breakage. You can't even move the body out of the way, because the belt and scabbard are both attached to the upper torso, so they move when it does. Both hands are open to hold the swords. So. Sean Bean. He can't make it out of the first Lord of the Rings movie, and he can't make it out of the first season of Game of Thrones, but he makes for a good action figure.